Mount Mitchell, the highest point east of the Mississippi, towers over the scenic Blue Ridge Parkway. When I told several friends I'd visited North Carolina this summer, each asked me the same question: "How was the beach?" That surprised me — North Carolina, to me, is not about sunny beaches; instead, it evokes the extreme other end of the state, with its misty, tree-covered mountains, hidden waterfalls and scenic vistas. Geologically, the Blue Ridge province is the easternmost edge of the Appalachian chain in North Carolina, bounded by the folds of the Valley and Ridge province to the north and west, and the more gently rolling Piedmont region to the east. Compared with the dramatic scale of the Rocky Mountains, or the still-rumbling Cascades, the Blue Ridge's mountains seem rather gentle, with characteristic scenes of layer upon layer of fading bluish mountain tops stacked one behind the other. From the scenic Blue Ridge Parkway, motorists can enjoy many stunning views of this part of the Appalachians. The parkway was originally a Depression-era public works project which took decades to complete and has now become the country's first (and longest) rural parkway. It winds north-south around some of the tallest peaks in the mountain chain, connecting Shenandoah National Park in Virginia with the Great Smoky Mountains National Park in North Carolina. With its meandering turns, frequent overlooks and a parkway-wide speed limit of 45 miles per hour (72 kilometers per hour), it is designed for leisurely viewing and short-term hiking. 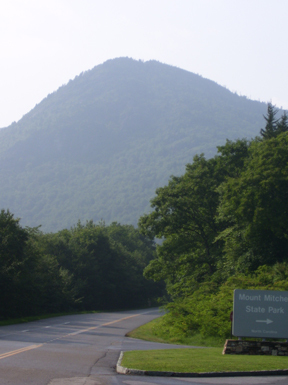 The Appalachian Trail (a 3,500-kilometer greenway that runs from Georgia to Maine) crisscrosses the parkway frequently, and trails accessible from Visitors' Centers or overlook parking often overlap with or connect to sections of the trail. Motorists can easily access the parkway from Asheville, N.C., a city of 70,000 people in the heart of the Blue Ridge. Notable stops are easily located by mile markers, including the Folk Art Center, just south of Asheville (at mile marker 380) and the Museum of North Carolina Minerals (at mile marker 330), which details the geological history of the mountain chain and the common minerals found there. Numerous short hikes to nearby waterfalls, such as the Glassmine, Crabtree and Linville Falls, are also easily accessible from the parkway. Along its winding path, the parkway's roadcuts also offer glimpses into the mountains' makeup. Metamorphic folds, anticlines and synclines and bands of light and dark-colored minerals indicate the powerful geological forces that shaped the region. Farther north and just west of the parkway is the highest peak east of the Mississippi, Mount Mitchell, with an elevation of 2,037 meters (6,684 feet). Although not directly accessible from the parkway, the summit is accessible by a short drive along Route 128 (which connects to the parkway at mile marker 355). Mount Mitchell State Park includes a family campground and hiking trails through the park, as well as an exhibit hall that details the geology of the region and the story of its namesake Dr. Elisha Mitchell. Mitchell was a geologist with the North Carolina Geologic Survey, who came to the region in 1825 to map it, and spent the next 30 years exploring and surveying in the region. It was he who determined that the mountain is the highest peak on the East Coast. In 1857, however, Mitchell disappeared, and his body was eventually discovered at the foot of a waterfall by a well-known mountain tracker and hunter, "Big Tom" Wilson. Whether you're out for a leisurely drive, a picnic or hiking and camping, the Blue Ridge Parkway offers beautiful vistas and startling scenery, and is truly a unique national treasure.